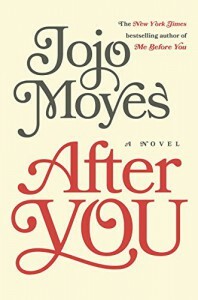 As much as I loved "Me before You", I have to say that the sequel didn't come that close to the first part, in terms of the characters, as well as the storyline, which at some points was a little bit too far fetched for me... Also, Louisa was getting reeeally on my nerves for her lack of capability to get a grip of her life! I mean, Will left her a really nice, big sum of money, intending for her to really change her life and make something special out of it, and all she does is going to Paris for some time, working in a bar there (?!? ), not feeling comfortable enough to stay there and actually do something worthwile, and then choosing to go back to the UK, buying an apartment in London and working in a bar (at an airport?!?) again??? ..
Well, but I also can't say that I didn't like "After You" at all. I liked parts of it, and I also could understand Lily's actions and reactions from time to time, though she also could get quite annoying ;) 3 points are fair enough I guess.